Tienkels Vintage Cars was bought over and changed ownership in March 2015, and was effectively merged into the Gullwing Classics & Restorations group on 1 April 2015. 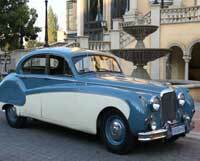 Tienie Pitzer was the custodian of his lovely cars brought into our larger pool of Vintage & Classic cars. New owner, Morne Du Toit, shares his passion for cars and have been a collector of rare, mostly Mercedes bens models, for the past 20 years. We also have a large selection of cars from private owners on board that we contract out to to enable us to provide our large client base with a bigger variety of luxury classics. Not only do we rent out these beauts, but also work on them with tender loving care, by servicing and even full bolt and nut restorations. We also sell classic cars and trace and source rare collectibles for our clients and collectors. We strive to give our clients the most unforgettable experience possible and are proud to be part of your loving memories and photo collections for life. Our aim is not only to run this passionate company as a business, but to build working relationships and friends for life. Cars are such a beautiful part of live and deserves to be shared with everyone.